Senior leader of the Insurance employees’ movement Com J Gurumurthy pledged to donate his body (cadaver donation) for harvesting of organs and for Medical Research. This was announced by him in the felicitation function got up for him at Chennai on Dec 4 in connection with his retirement from United India Insurance Co after four decades of service. Com AK Padmanabhan (President, CITU) was the chief guest on the occasion. Com Gurumurthy was recently re-elected for another term as Joint Secretary of All India Insurance Employees’ Association (AIIEA) & as Secretary of Standing Committee (Gen Ins) in the national conference of the Association held at Delhi during Nov 20-24. JG is a regular blood donor and he has already pledged for eye donation. We salute Com.JG for his noble lead. *Comrade Gurumurthy has set an example for others . Convey my congratulation to him and family. *SALUTE TO A REAL SOLDIER OF INDIA & A.I.I.E.A. *Hats off to Com JG for his noble gesture. *The very thought process has touched my heart. **Great. Congrats Mr. Gurumurthy. As usual you r an unusual man. Regards and all the best in your retired life. *Kudos to Com GJ and aiiea. Only aiiea can donate such great leaders who can set example for others to follow. **Wish you a very happy and active retired life. Happy to note u have followed Mr.Jyoti Basu to donate cadaver. *As a leader of a militant Association u have set an example to be followed by the cadres like us. Thanks. Hats off to you. I am simply amazed and speechless. You are a great 'Human Being'. Your decision is unique and unparalleled. May God bless you. *Dear Gurumurthiji, at first, let me wish you a very very happy & peaceful retired life. Dear Guruji, Mr Arun Goel, who had once been Internal Audit Incharge, RO Delhi had been here at Moradabad on Thursday. He was enquiring about you. Probably, he knows you very well. Dear Guruji, I honestly believe you have won hearts of so many people. Today, S K Verma rang up to me and he was saying that your image is such that not only AIIEA but whoever knows you personally will feel proud about it. I personally feel that whenever you came across any genuine request/demand from the employee's side, you joined hands & worked for it from the core of your heart. On hearing of your retirement on 30th Nov morning, for sometime, I had the feeling that I was losing something absolutely very very precious. *A very noble soul indeed. Also wishing Mr JG a very active & peaceful retired life. **JG is a true leader who has contributed even his body for the public cause needs salutation. Pl convey my personal respects. Regards. *My appreciation and compliments. I will insert d news to b followed by others. *Commendable decision. My best wishes. **You have inspired many into movement. Now inspired for cadaver donation. Red Salute to you beloved comrade. * It gives me a great pleasure to note that Com. Gurumurthy has escalated to a very great height by his donation announcement. I am recalling my association with Com. Gurumurthy. I had the opportunity of attending the wedding of Com. Gurumurthy, which is still green in my memory. It is still unbelievable for me to reconcile that Com. Gurumurthy, whom I know as an young boy, has retired from the services of United India Insurance Company. As a close comrade, I wish him a good health and continued activities as Com. Rajappa does now. * When I learnt Shri J.Gurumurthy is demitting office, I became speechless and started wondering whether it is the same Gurumurthy, Southern head of AIIEA or someone in AIIEA. Really we all will be missing his leadership and guidance. I personally will be missing his valuable advice and guidance as far as TAC is concerned and briefing on other insurance related matters in general. Bravo. What a noble gesture on his part to donate his organs for a very good cause. More than any thing else he has proved that he is a very good human being. It is heartening to note that Com.J.Gurumurthy has been re-elected as Joint Secretary of AIIEA & Secretary of Standing Committee. ** Mr.Gurumurthy has done the greatest sacrifice a human being can think of. * Congratulations. your life is a message..
* Tussi Great ho !!!! You are a real Murthy of GURU ! ** Thanks very much for the excellent documents that graphically highlight the purposeful activities of Com Gurumurthy, which I read with deep appreciation of this stalwart soldier and commander of AIIEA. That I am denied the opportunity to be present for the felicitation function is my illuck. 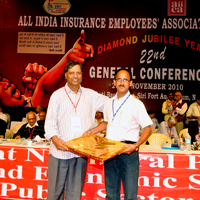 A comrade of this calibre deserves not merely recollection of his services to the insurance employees in the Non-Life sector but should enthuse others to emulate his example so that the great fraternity of AIIEA is always never short of brilliant and efficient personalities like Com Gurumurthy. I know Gurumurthy and he would be the happiest if somebody from amongst the cadres of AIIEA in Non-Life sector excel him through their services to employees and humanity. Such is his selfless nature and concern for others who are associated with TU and people's movement. This man has inexhaustible energy to be always doing some thing good as well as rewarding to society especially the poor and the deprived sections and so I have no doubt that his retirement from employment only makes him freer to pursue the activities of his choice with redoubled vigour. Your excellent biographical sketch was informative to me. The sum and substance of your write up is to pin point the fact that without being a qualified lawyer he is a legal luminary directly serviceable to employees and others, without being a qualified Management expert he has managed to acquire the acumen and turn it to the advantage of common people especially employees and the public sector industry, without being a professional he has emerged as somebody who a seasoned professional would point to others as one of the best role models for the art or trade, without being a trained media person by his simplicity and ability to marshall the points, he is now somebody the visual media audience in Tamil Nadu look at with admiration, without being some one who passed the tests of literary heights through universities, he has carved for himself a sublime position as a writer as well as speaker both in Tamil and English. The happiest part of all these achievements is that he never wants to be known by these and always thinks of AIIEA as the one and only school or university that taught and moulded him. That he acknowledges willingly and none else. The man of such potential should play greater roles and our comrades in Tamil Nadu should strive for that. Before closing this letter I must add that Com Gurumurthy has made Com Sathanam the prouder, for he has brought forth to limelight and use the potentialities ever present in Com Gurumurthy. I convey my great admiration and regards to Com Gurumurthy. One ought to (zestfully) desire to live for a hundred years by being solely engaged in discharging one's duties. This is the ordainment for you and there is none other. Nor does action (performed as indicated in this verse) cling to you. (2nd verse of the same). I do not believe in any lord / god, and lord here means for me "the common". I will continue to learn from him and receive love and blessings. Your creative endeavor is excellent. Hope your blog is visited by all the soldiers of AIIEA. Just I am walking in the footprints of AIIEA.